Hyderabad: Three persons were killed on the spot when a speeding RTC bus mowed them down at 6:30 am at Gachibowli chowrasta on Monday. The Raidurgam police identified the victims as 35-year-old S. Janardhan, a software employee, and two auto drivers, Abdul Hameed, 50, and B. Dhasharath, 42. Some of the victims’ relatives are demanding compensation. Dashrath’s younger brother, Raju, said, “We used to live in Nanakramguda and every day my brother used to go to Gachibowli chowrasta looking for customers. He was the sole breadwinner of the family and is survived by two children, a nine-year-old girl and an eight-year-old boy. On Monday morning, some auto drivers came to our house and informed us about the accident. We immediately rushed to Osmania General Hospital,” he said. 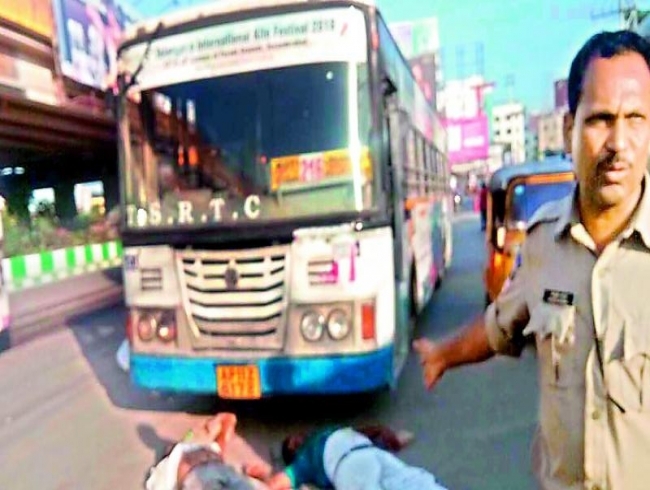 Sundha Parimal, divisional manager, charminar division who visited the accident spot said, “The private bus from which the victim, Janardhan, deboarded was stopped in the middle of the road. They were parked in the bus bay and the drivers were negotiating with the customers and the RTC bus which came from behind mowed down the victims. It was the fault of every one,” she said.